Q: What does your typical day at work look like? 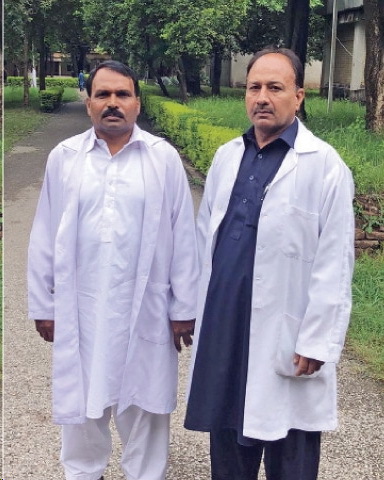 Maqsood: We receive snake supplies at the National Institute of Health (NIH), categorise them and make a schedule for extracting their venom, which can vary from once or twice a month for a snake. All snakes have seasonal variation, for example, you cannot extract venom when snakes are in hibernation but the first extraction when they wake up in March or April, is highly venomous. 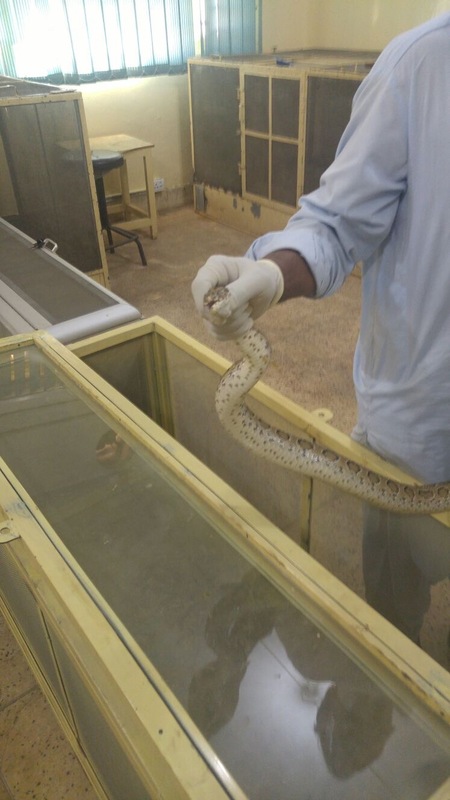 After extraction, the snakes are fed a mix of eggs and milk via a syringe and let to rest for between 15 days and a month, depending on the snake. Q: What sort of snakes do you have at NIH? 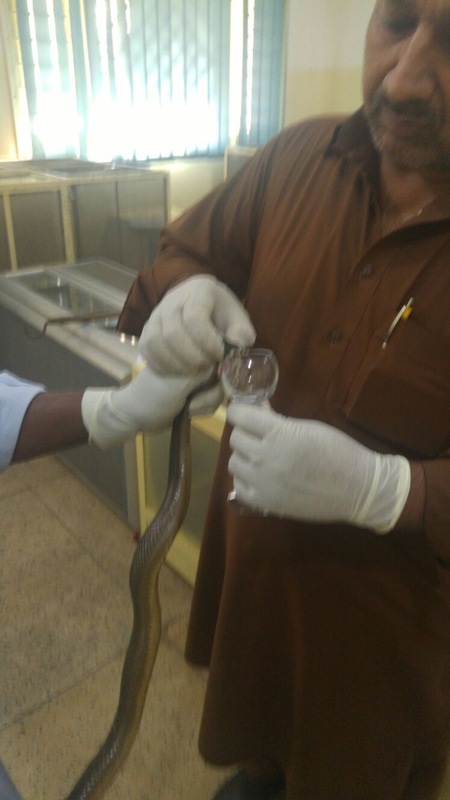 Razzaq: According to WHO guidelines, we extract venom from medically relevant and the most encountered species, but we can manufacture anti-venom for other snakes on demand as well. Because snakes are specific to a certain region, we cannot depend on other countries to provide us with anti-venom, except for India. We have 28 venomous species but most of them are not encountered. The most common are Cobra, Krait, Saw Scaled Viper and Russell’s Viper. The Cobra is poisonous, but the Krait is 10 times more. It is a nocturnal snake, which comes out during the night and bites silently and that is the most common snake in Islamabad and Rawalpindi. The Saw Scaled Viper coils around and jumps before biting. The Russell’s Viper is more common in Sindh. Q: What is the procedure for venom extraction? Maqsood: The two of us have to work together to extract venom. It requires a lot of concentration and collaboration. We have to work like a well-oiled machine. There are different procedures for different snakes. Cobra and Krait have the same procedure: you pick up the tail by a stick and then hold the tail in your hand. You lift the snake up and position it so its head is on a table. You hold its head down with the stick, so the other extractor can hold it. He then opens its mouth, so its upper fangs are over the brim of a miniature wine glass where the venom collects. The other two snakes have to be handled entirely by a stick. Venom has to be extracted manually, and the possibility of being bitten is always there. That is why there is always a first aid kit and observers in the room. We also have to be relaxed before the extraction and the department does not put any pressure on us before the procedure. If extraction is not done carefully, the snake can be injured during the extraction as well, because this is not a natural injection of venom. So you have to be careful for yourself and for the snake. A snake will try to bite you. When you pick it up, the snake is stressed and ready to attack. You cannot be distracted for even half a second. You cannot afford to lose grip on a snake. We extract venom from about 40 to 50 snakes a day. Q: What happens to the venom then? Razzaq: After we have enough venom, it is diluted and injected into a horse. It takes months for the horse to develop anti-bodies after which we collect 10 litres of blood from the horse. A horse has more than 60 litres of blood in circulation at a time so extracting 10 litres does not harm the animal. We have a schedule for the horses so that their health is not affected either. The blood from horses is taken for plasma separation and downstream processing in a laboratory. The whole cycle takes about two-and-a-half years. Q: What qualifications do you need to be a venom extractor? Maqsood: There is no specific qualification, but you have to have expertise. The training comes on the job from observing because there are no institutes for such training. You have to be mentally prepared for such a job. We were already working at NIH and moved to venom extraction from observation.